10 Holiday Kitchen Gifts – Things I Can’t Live Without! Okay, so saying that I can’t live without something is relative, right? Yes, I could live without a standing mixer. But would the people in my life who receive the treats made from it actually want me to? Questionable. There are so many blogs about the best gifts for this and that online. And I am guilty in my day job of writing for other people’s websites of contributing to those lists. But the other day a new person in my life was in my kitchen and I pointed to a saute pan and said “I could do without all the things in my kitchen except for THAT”. THAT slowly turned into four or five things that make the family I could basically cook anything from. So here are those and a few other of my little favorites of varying expense that are sure to add a little Dusty pleasure to holiday stocking or nestled under the tree. If you have a chef in your life that you’re looking for the perfect last-minute holiday cooking gift, you can’t go wrong with one of these babies that I’m slightly and probably unhealthfully obsessed with. Click on the images to find the products online. $55.00 on Amazon with lid. Also at Home Goods and TJMaxx sometimes. I am a big believer in stainless steel over non-stick. Cuisinart makes an incredibly affordable line of quality stainless steel pans. They heat evenly, have a nice weight to them, clean up easily and are impeccable with letting the flavor of your food come through. I use it to brown meat, fry eggs, saute vegetables, fry donuts… it goes from stove to oven so frittatas are yummy and meat dishes get a good browning under the broiler. $65 at Home Goods or starting at $200 online. I am in love with this piece of equipment. So much so that this picture is one of many I have taken of it. And I love Le Creuset in particular. I’m sure there are comparably good french cast iron pieces of cookware, but I don’t need to meet them. I have penned poetry about this pot. Sad? Yes. But this pot has made countless delicious soups, nestled lamb loins, sweetened peaches for pie, sauteed vegetables into gooeyness. It goes from stove to oven to table. If I could pick one piece of equipment to cook in, this would be it, in this size (I also own the 3.5 quart oval and the 9 quart round). I got mine at Home Goods for about $65. But I’d pay $200 if I had to. If you have a cook you love in your life, get them one of these and don’t be surprised if you see tears. These are a both a guilty pleasure and a practical, almost indestructible necessity for the kitchen. The silicone is safe for all surfaces, so pots and pans are protected from scratching. The spoonula is perfect when sauteing vegetables. They come in all sorts of pretty colors that make an appealing assortment when out on a counter. I get them randomly as presents and never complain. I got one of these a year ago from a local kitchen store and it’s now my go-to. The flexible steel yields to cookies, eggs, meats and vegetables perfectly, so food that is slightly soft doesn’t threaten to break. I actually rarely use a stiff spatula now. And at only $8 and virtually indestructible, it’s a steal. People I’ve gifted it to love it. Stocking stuffer. Oh yes. Yes, ghee. 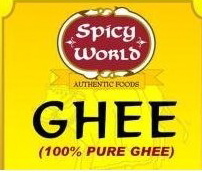 Ghee is clarified butter most commonly known in Indian Cooking. Regular butter is heated at a low temperature so that the protein solids separate from the pure, delicious ghee. It’s so much more tasty than regular butter. It has a higher smoking point, a deliciously nutty taste, and rounds out dishes perfectly. While I don’t use it in baking, it’s my go-to butter when I cook. In sauteed vegetables I usually use olive oil as my base, and then add some ghee at the end to pump up the flavor exponentially. If I had only one fat to cook with, it’d be ghee (though I’d cry a little at the loss of duck fat and olive oil). And, yes, it’s perfection on toast. This is one of the best kitchen gifts I’ve ever been given (ties with the first Le Creuset my mother gave me). Quick story: I had inherited one from my boyfriend’s parents that made literally thousands of cookies and hundreds of pies, breads and cakes in the 30-years they owned it. And they’re ridiculously delicious bakers. The work kept going in my kitchen until the boyfriend became the best friend and the mixer went with him. I ended up borrowing his father’s so often during the holiday season last year that he gifted me one for Christmas. Thanks, Kevin! It’s indispensible for quick pie crusts, whipping egg whites into stiff, peaky perfection, kneading bread dough… there’s nothing a good mixer can’t do. Soon I hope to get the grinding and pasta attachments for it. If you want to wow with a present, get a KitchenAid. Okay, so this technically isn’t a cooking thing. But I love good coffee and love offering it to my guests. And after experimenting with standard coffee makers, espresso makers, one-touch systems, a simple drip filter and the lovely French Press, this is my favorite. I love the 3-cup one specifically because it makes just the right amount of really strong coffee for me to mix with hot water into a perfect Americano. And, as this Dusty Baker always seems to be moving, it fits so easily into luggage and comes with me wherever I move. And you need nothing but heat to make coffee – perfect for electric or gas stoves or the campfire! Delicioso! These are ingenious. They protect your counter and then fold easily to ease food into pots and pans. Nothing more to be said. Inexpensive and worth their weight. I use a Cutco standard 9.25 inch chef’s knife. Granted, I’m not as versed in knives as others, and I hope to be able to afford an upgrade in the future. But I’ve had this knife since my 2nd year of college and it still never fails me. Cutco knives sharpen easily and come with lifetime guarantees, so if it chips they’ll fix or replace it. A good knife is probably the most vital instrument in a kitchen. And this one ain’t bad. I lived by a Sur La Tabla last year and was instantly in love (and slightly addicted) to their affordable brand of products. These two jellyroll pans are my favorite for baking cookies – they’re thick enough that the temperature distributes evenly but not so thick that my cookies spread in scary directions. And when I’m roasting sides of pork or lamb, they can hold up to running fat and charred corners. I basically have one that I solely use for meats now, and a set for baking. Quality.